May Flowers! April showers bring May flowers, here it seems to be May showers bring the flowers, plus everything a vibrant, luscious combination of pinks, yellows, purples and greens! Craftywise flowers are everywhere, created from fabrics, zippers, distressed papers, felt, leather embellished with buttons and beads. They can be created quickly then added to a bag, a neckline, belt, headband or any fashion piece to create a fresh look for spring. 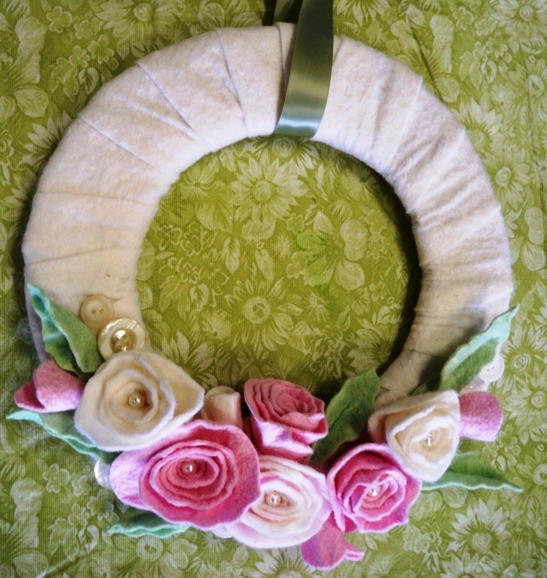 This easy wreath has roses made from circles of wool felt cut into spirals, rolled and glued. I cut the circles with scalloped scissors. Follow the JOY! Debra, CEO!